We continue our exploration of Wowa Cwjeman's new range of exclusive analogue synth modules. Last month I introduced you to the new range of Cwejman synthesizer modules and reviewed the largest of these, the VM1 Voice Module. This combines a powerful oscillator, an excellent filter, remarkably rapid envelopes and a VCA in a single unit that echoes the Oberheim SEM, and is little short of being a complete synthesizer in its own right. Nevertheless, the VM1 does not, in itself, offer the flexibility of a truly modular synth so, if it's not quite up to the job in hand, what do you do? Look elsewhere for more fully-featured products? No, of course not — you turn to the wider family of Wowa Cwejman's beautifully presented new modules and, in particular, the VCO2 RM dual oscillator, the MMF1 multi-mode filter, the ADSR VC2 dual transient generator and the VCA2P panning VCA, the combination of which does everything that the VM1 does, and much, much more. All Cwejman's modules are designed to look and be used in much the same way as his flagship S1 MkII, with clear legending and all the input and output sockets situated below the area containing the knobs and switches that control their functions. Behind the scenes, they also share family traits, with low current requirements, metal cages protecting the circuitry, single board construction, and surface-mount technology replacing the large, discrete components that form the basis of vintage modular monosynths. They all fit standard 3U Euroracks, and sit comfortably in the cases supplied by Analogue Systems and Doepfer. However, they are shallower than AS and Doepfer products, so I look forward to Cwejman's (rumoured) case, which should allow users to configure systems so that they'll look much like an enhanced S1 MkII. Turning first to the dual oscillator module, the VCO2 RM incorporates two of the one-volt-per-octave oscillators that are becoming one of Cwejman's hallmarks. This means that they each offer seven waveforms with coarse- and fine-tuning, accurate tracking over a wide range, and manual pulse-width control as well as PWM of the pulse wave and the pulse-wave element in the mixed pulse+triangle and pulse+sawtooth waves. However, the flexibility of these oscillators extends well beyond the single oscillator found in the VM1. Most obviously, each oscillator in the VCO2 RM has an LFO mode, which means that a single module will satisfy many sound source and modulation requirements. The lowest frequency cycle lasts almost 100 seconds, slow enough for the most languid sweeps, if you can be bothered to listen to them. The VCO2 RM also offers 'sync', with external sync inputs for each oscillator, and a switch that selects an internal sync path with Oscillator 1 acting as master and Oscillator 2 as slave. Given that there are three independent pitch CV inputs for each oscillator, this means that you can create a much wider range of sync sounds than is normally possible. 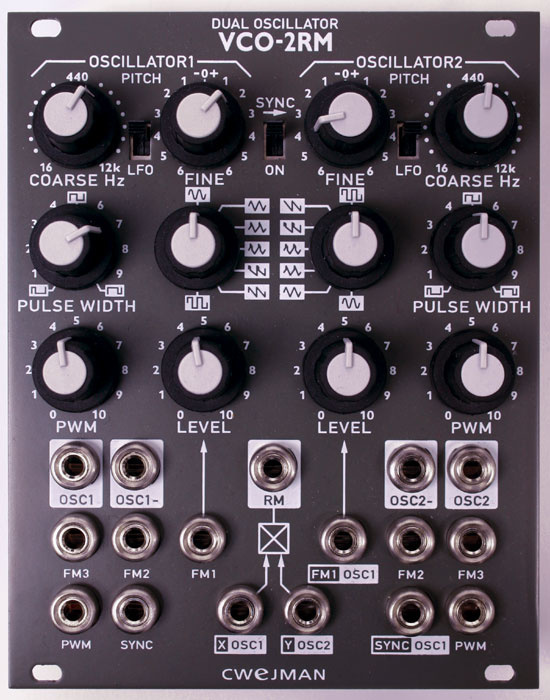 Talking of CV inputs, two of those on Osc2 are dual function, with FM1 pre-patched to Osc1 for FM sounds or vibrato (the depth of which is controlled by the FM1 knob) and the Sync input pre-patched to Osc1 to facilitate the internal sync capability. Each oscillator also offers two outputs, one with positive polarity, the other inverted. Not so important when using them as audio sources, this makes them extremely flexible when designing complex or complementary modulation CVs for external modules. In addition, the output from each is pre-patched to the 'X' and 'Y' inputs of the DC-coupled ring modulator. Wowa Cwejman seems to like DC-coupled RM's (there's one on the S1 MkII) but I would have preferred an AC-coupled device because this eliminates the source signals from the output. Indeed, the best synthesizers have switches that allow you to select between AC- and DC-coupled operation, but I'm not going to complain... The VCO2 RM already offers far more in this department than any other Eurorack oscillator module. Like the VCO2 RM, the MMF1 comprises a superb package of facilities and ideas. Most multi-mode filters offer a maximum of three modes — low-pass, high-pass, and (if you're lucky) a band-pass mode lying between the two. In contrast, the MMF1 offers 11! These are low-, high- and band-pass with a choice of two-pole or four-pole operation; single notch (two-pole) and dual notch (four-pole); plus dual band-pass, with resonance of the upper band, the lower band, or both bands. However, unlike the VM1, there is no mode 'morph' capability, so you can't sweep between filter responses as you can on the otherwise simpler device, and, unlike the S1 MkII, there is no six-pole (36dB/octave) option. Still, you can't have everything. As you would expect, the filter will self-oscillate in all modes, and this is particularly interesting for the dual band-pass filter with dual resonance, because it allows you to accentuate two narrow bands for a limited form of vocal 'formant' filtering. (Alongside the standard cutoff frequency and resonance controls, a Spacing knob allows you to determine the relative positions of the two bands.) Pushed harder, this mode will also oscillate at two pitches! Like the oscillator module, the MMF1 is replete with inputs: two mixable audio inputs, and four filter control CV inputs — two for the cutoff frequency, one for the amount of resonance, and one for the spacing between the peaks of the dual band-pass modes. Unfortunately, there are only three attenuators for these inputs, one each for cutoff frequency CV1 and CV2, and for the resonance CV. This means that there is no attenuator for the spacing CV, which is a shame because it makes it difficult to 'play' the two peaks unless you use an external attenuator. But, as before, to quibble would be churlish. Whereas other manufacturers tend to offer single VCAs (per module, of course) with multiple audio and CV inputs, the Cwejman VCA2P panning VCA module offers dual, switchable (logarithmic/linear) VCAs that you can use independently and as a stereo pair with voltage-controlled panning. The complexity doesn't stop there. If you look at the inputs in the lower half of the module, you'll notice that — underneath the three audio inputs — there are two input level CVs for each of the Left, Right and Pan channels. Behind these lie additional VCAs that allow you to modulate one CV with another before presenting the result to control the gain of the audio VCA itself. So, to recap, you can present three independent audio signals to the VCA2P and control the amplitude of one channel using two CVs (one modulating the other), control the amplitude of a second channel using two different CVs (one modulating the other), and control the panning position of a third channel using two further CVs (again, with one modulating the other). Wow! This side view of the VCA2P shows just how slim Cwejman's modules are. Just to give you an idea of how flexible this is, imagine a situation where you have one audio signal presented to the Pan input and a second signal presented to the Right input. Now take the positive output from one of the oscillators in the VCO2 RM and present it to the Pan CV input on the VCA, at the same time taking the negative output from the oscillator and connecting it to the Right CV input on the VCA. If you set the oscillator to LFO mode and select the pulse waveform, the VCA2P now acts as a switch between the two signals. Use a different waveform, and you can crossfade between audio channels. If you're synthesizing evolving sounds, this can be very interesting. If you're using external audio from sources such as CDs, it's a remarkable tool: not unique, perhaps, but quite unexpected from what appears on the surface to be a simple VCA module. VCO2 RM Oscillator (20HS, 75mA) - 469 Euros. MMF1 Filter (14HS, 50mA) - 383 Euros. 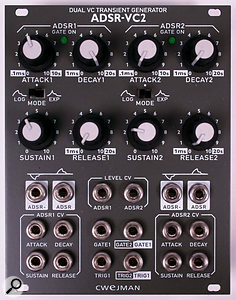 VCA2P Panning VCA (10HS, 50mA) - 359 Euros. 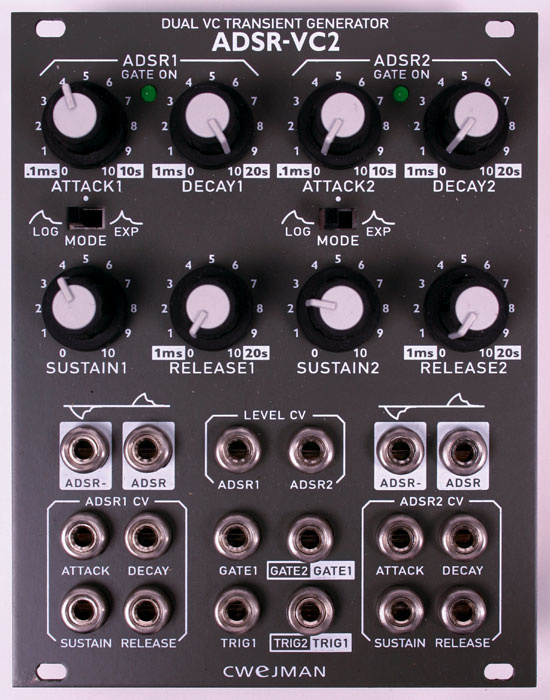 ADSR VC2 Dual Transient Generator (20HS, 30mA) - 439 Euros. Finally, for this month, we come to the dual transient generator that belongs alongside the dual VCA. 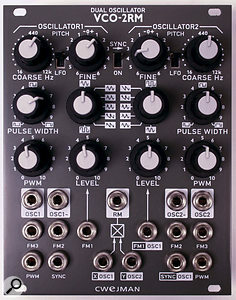 Of the four modules presented here, this appears to be the most intuitive, with each transient generator producing the conventional ADSR shape. However, a switch within each ADSR hints at deeper things, because it allows you to select between logarithmic and exponential shapes. This is not trivial. The characters of the sounds generated by early monosynths were often determined by the shapes of the A, D and R stages of their contours. Consequently, the ADSR VC2 allows you to emulate a wide range of vintage synths (as well as create new sounds) with much greater flexibility and authenticity than would be possible with a logarithmic or an exponential response alone. If this wasn't enough, you can tap the output of each generator in positive and negative polarity, and there are independent triggers and gates for each generator, plus an overall Level CV for each (which, if you think about it, also allows you to modify the ADSR profile as it is progressing!). Nevertheless, the coup de grace must be the eight CV inputs that allow you to modify the timings of the A, D and R stages of each generator, as well as the Sustain levels of each. If you control the ADSR VC2 using a range of external CV sources, the range and nature of the transient shapes that you can generate heads off toward infinity. Furthermore, you can combine the overall Level CV and the ADR time CVs to create velocity-sensitive responses that not only allow you to make things sound brighter and louder as you play harder, but also display the correct changes in duration as you modify your playing. I don't think that I have ever encountered an analogue contour generator module that is laid out so clearly and which offers such a high level of control and flexibility. Given the remarkable snappiness of the contours themselves (see the 'Putting It All Together' box), I must admit that I am a fan. So, how do the Cwejman modules actually sound? The answer, as is becoming standard with Wowa Cwejman's products, is 'precise'. As I've written before, this is a hard concept to put into words but, like the S1 MkII, these modules do what you want without colouring or enhancing the sound beyond what you ask. Furthermore, they share the S1 MkII's character, as well as that of the VM1, so it's fair to say that there's a 'house sound' being developed here and, if you like the character of any of Cwejman's products, I suspect that you'll like them all. If you don't like any of them... well, I don't know why you wouldn't like them. However, there's a caveat. Although these modules can sound bright, thin, fat, deep, simple or complex, they don't excel at the great big, fat splodgy sounds that you can coax from some systems. This is probably because the oscillators don't overdrive the filter input, and there's no distortion section as found on the S1 MkII. But to provide this, and more, Wowa Cwejman is developing... ah, but that's something I'm not yet at liberty to reveal. Sorry! It seems to me that Wowa Cwejman has set out to design and build modules that reach beyond the capabilities of the equivalents supplied by his competition, whether in 3.5mm (primarily Analogue Systems and Doepfer) or quarter-inch format (MOTM, Modcan, and others). In this, I think that he has succeeded. While not cheap, these modules do things that many others do not, and without sacrificing any audio quality. So, what of the future? 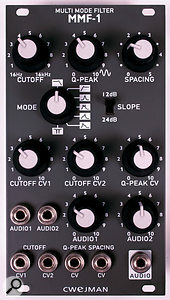 A trip to Cwejman's website (www.cwejman.net) demonstrates that these four modules are the 'meat and potatoes' of his modular range and that there are three further modules already available — a stereo ring modulator, a three-band voltage-controlled formant filter, and a multi-function dual LFO. I also happen to know that there are five further, rather exotic, modules in the pipeline. OK, I accept that even the full Cwejman modular may not be quite as radical as (say) a Buchla, but Wowa Cwejman has achieved something far more significant than mere weirdness. As well as stepping beyond the norm, everything I've tested here (with the exception of one minor fault on the pre-production VCA2P, which I'm not even going to bother to describe) works perfectly, and exactly as portrayed by the manufacturer. If Cwejman adds the multiples, noise generator and slew generator I've suggested, brings out the dedicated case that is rumoured, and gets round to writing a manual (the review modules arrived without documentation), it's going to become hard to find anything to criticise. Well done! Let's try to patch a simple trumpet sound by taking the sawtooth output from an oscillator and directing it to the VCF in low-pass mode, and then onto one of the VCAs, shaping the filter using a contour with a slow Attack and Decay, while shaping the amplifier with a 'square' contour. (The second oscillator in the VCO 2RM can be used to provide a little vibrato if you wish.) So far, so good. Now, using a conventional, low-cost synth to provide CV and Gate, you would connect the pitch CV output to one of the appropriate inputs on the audio oscillator, and the Gate output to the Gate 1 input on the ADSR module, whereupon it will Gate both contours simultaneously. Setting everything appropriately, you can now play your patch, and it will sound superb over a small range. But if it's bright enough at the top of the keyboard, it will be too bright at the bottom, and if it's correct at the bottom, it will be too dull at the top. This is because there's no way for you to get the filter to track the pitch CV at the same time as the oscillator is tracking it. To overcome this, I took a handful of RS170 dual five-way Multiples (which require no power, so will fit in any case) from my RS Integrator system and screwed them in alongside the Cwejman modules. Now I could direct the signals from the controlling synthesizer to any number of destinations simultaneously, and direct things such as ADSR contours to multiple destinations for all manner of complex effects. I found the lack of mixers to be less acute a problem, because the MMF1 offers two audio inputs and the VCA2P offers three, while at the same time the VCO, VCF and VCA are not short of independent, mixable CV inputs. Nonetheless, it's good to be able to mix CVs freely, so I added a couple of RS160 mixers to the system. The results were magic. I could now patch sounds and set things up as I wanted, and although the system was somewhat smaller than the mega-synths that you tend to see in photographs of the studios of the rich and famous, the range of sounds available from Cwejman's dual oscillators, ring modulator, single filter, dual VCA and dual contour generators was immense. As always, I tested the waveforms and responses of the various modules, and found that my subjective impressions were borne out by objective measurement. For example, while the oscillator's waveforms exhibit the same, slight misshapenness of the VM1 oscillator (which, from their traces, I suspect to be the same circuit) their performance exceeds the promised figures, with a range of 10Hz to 17.6kHz using the knobs alone, and more with CVs. Likewise, the filter's performance outstrips its quoted specifications, and although its response is a hair narrower than the VM1's, it still boasts an impressive range (unaffected by CVs) of 18Hz to 17.8kHz, and from DC to supersonic with CVs applied. Then there are the superbly snappy contour generators, with Attack times in the sub-millisecond range (my measurements showed a fastest response of approximately 500 microseconds) and Decays and Releases of the order of two to three milliseconds. Of course, these figures don't tell you how good or bad things sound, but a test of this sort can reveal a lot about a synth's capabilities. For example, you can't have bright sounds if the waveforms are rounded off and lacking in high frequencies, and you can't create snappy percussive patches if the contours are lazy — and so on. Indeed, had someone tested the latter-day ARP Odysseys, 2600s and Axxes before they left the factory and noticed that the maximum filter cutoff frequency had dropped from 35kHz to around 12kHz, we would never have had the situation wherein none of these instruments sounded quite as good as they used to. Remarkably flexible in all departments. 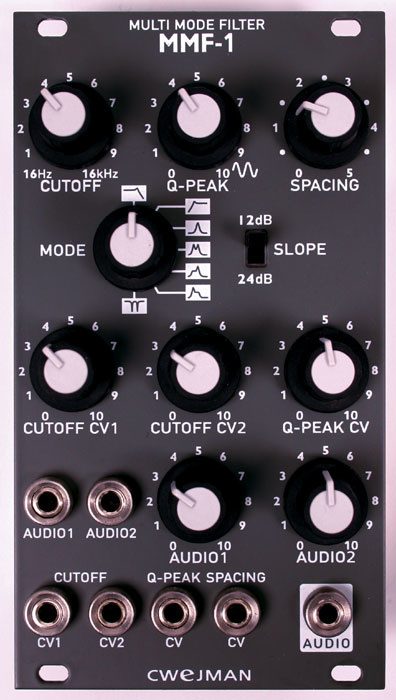 Can be used as the basis of a very powerful modular synth or as adjuncts to existing systems. You need to add external multiples and mixers to get the best from them. I think that Wowa Cwejman has hit pay-dirt. Each of his modules does more than you might expect, and does it exactly as you would want it to, without faults or unpleasant surprises. You can't yet construct an all-encompassing modular synth using Cwejman modules alone, but there's no way you should configure any Eurorack-based synthesizer before you have tested them and considered allocating some space for them.